There has been a lot of hype and confusion surrounding the marketing of "LED" TVs. Even many public relations representatives and sales professionals that should know better are falsely explaining what a LED Television is to their prospective customers. LED televisions are made by a variety of manufacturers including, but not limited to, those made by LG, Samsung, Panasonic, Sony, and Vizio. To set the record straight, it is important to note that the LED designation refers to the backlight system used in many LCD Televisions, not the chips that produce the image content. LCD chips and pixels do not produce their own light. In order for an LCD television to produce a visible image on a TV screen, the LCD's pixels have to be "backlit." For more specifics on the backlighting process needed for LCD Televisions, read more about demystifying CRT, Plasma, LCD, and DLP Television Technologies. At their core, LED TVs are still LCD TVs. The difference between the two, as mentioned above, is the backlight system used. Most LCD TVs employ LED backlights rather than fluorescent-type backlights, thus, the reference to LED in TV advertising hype. To be technically accurate, LED TVs should actually be labeled and advertised as LCD/LED or LED/LCD TVs. There are currently two main ways that LED backlighting is applied in LCD flat panel televisions. One type of LED backlighting is referred to as Edge Lighting. In this method, a series LEDs are placed along the outside edges of the LCD panel. The light is then dispersed across the screen using "light diffusers" or "light guides." The advantage of this method is that the LED/LCD TV can be made very thin. On the other hand, the disadvantage of Edge lighting is that black levels are not as deep and the edge area of the screen has a tendency to be brighter than the center area of the screen. Also, sometimes you may also see what is referred to as "spotlighting" in the corners of the screen, and/or "white blotches" scattered across the screen. When viewing daylight or lit interior scenes, these effects are not usually noticeable. However, they can be noticeable to varying degrees, when night or dark scenes in a TV program or movie are viewed. The other type of LED backlighting is referred to as Direct or Full-Array (also referred to sometimes as Full LED). In this method, several rows of LEDs are placed behind the entire surface of the screen. The main advantage of the full-array backlight is that unlike edge-lighting, the Direct or Full-Array method, provides a more even, uniform, black level across the entire screen surface. Another advantage is that these sets may employ "local dimming" (if implemented by the manufacturer). Full Array Backlighting combined with Local Dimming is also referred to as FALD. If a LED/LCD TV is labeled as Direct Lit, this means that it does not include local dimming, unless there is additional description qualifier. If a LED/LCD TV does incorporate local dimming, it usually referred to as a Full Array Backlit Set or is described as Full Array with Local Dimming. If local dimming is implemented, this means that groups of LEDs can be turned on and off independently within certain areas of the screen (sometimes referred to zones), thus, providing more control of the brightness and darkness for each those areas, depending on the source material being displayed. Another variation on full array backlighting with local dimming is Sony's Blacklight Master Drive,, which it introduced on a limited number of TVs in 2016. This variation uses the full array method as its foundation, but instead of local dimming using zones (groups of pixels), the backlight for each pixel can be independently turned on and off, which adds even more precise brightness and contrast control for both bright and dark object elements, such as eliminating white bleeding from bright objects on black backgrounds. However, it must also be pointed out that some edge-lit LED/LCD TVs also claim to feature "local dimming." Samsung uses the term micro-dimming, Sony refers to their version of this technical variation as Dynamic LED (on TVs that do not have blacklight master drive), while Sharp refers to their version as Aquos Dimming. Depending on the manufacturer the terminology used may vary. However, the technology employed consists of varying the light output using light diffusers and light guides, thus, is less precise than the more direct local dimming method used in Full Array or Direct-Lit LED/LCD TVs. If you are considering the purchase of a LED/LCD Television, find out which brands and models are currently using the Edge or Full Array method and take a look at each type when you go shopping to see which type of LED backlighting looks best to you. In LED/LCD TVs using the Full Array blacklight method, there is little or no light leakage in dark scenes. This contributes to even better black levels than traditional or LED Edge-lit LCD televisions. LCD TVs that employ Full Array or Direct LED backlighting are thicker than LCD TVs that employ an Edge-lit LED light source. In other words, LED/LCD TVs that use the Edge backlight method can be made thinner than both standard LCD and Full Array LED/LCD televisions. The only true LED-only TV-like video displays, such as (not to be confused with OLED TVs which is a different technology) are the ones you see in stadiums, arenas, other large event venues, "high-res" billboards, and a small number of cinema screens that employ technologies such as MicroLED. LED backlighting does represent an advance in technology, mostly in bringing LCD TVs close to Plasma Televisions in terms of black level performance, and, at the same time, making even thinner LCD TV designs possible. Another technology that is being incorporated into a growing number of LED/LCD TVs is Quantum Dots. Samsung refers to their Quantum Dot-equipped LED/LCD TVs as QLED TVs, which many confuse with OLED TVs. However, don't be fooled—the two technologies are not only different but incompatible. In brief, Quantum Dots are man-made nanoparticles that are placed between an Edge Lit or Direct/Full Array LED Backlight and the LCD Panel. 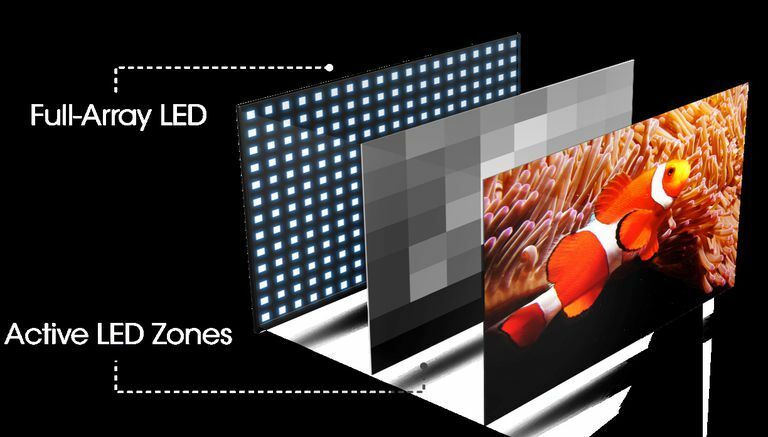 Quantum Dots designed to enhance color performance beyond what a LED/LCD TV can produce without them. LED lighting is also making its way into DLP video projectors. In this case, a LED supplies the light source instead of a traditional projection lamp. In a DLP video projector, the image is actually produced in a grayscale form on the surface of the DLP chip, in which each pixel is also a mirror. The light source (in this case an LED light source made up of red, green, and blue elements) reflects light off of the DLP chip's micromirrors and is projected onto the screen. Using a LED light source in DLP video projectors eliminates the use of a color wheel. This enables you to see the image on the screen without the DLP rainbow effect (small color rainbows that are sometimes visible in a viewers' eyes during head movement). Also, since LED light sources for projectors can be made extremely small, a new breed of compact video projectors, referred to as an LED light source in DLP video projectors eliminates the use of a color wheel. This enables you to see the image on the screen without the DLP rainbow effect (small color rainbows that are sometimes visible in a viewers' eyes during head movement). Also, since LED light sources for projectors can be made extremely small, a new breed of compact video projectors, referred to as Pico projectors have become popular. Since the demise of Plasma TVs, LED/LCD TVs are now the dominant form of TVs available to consumers. OLED TVs, that use a different technology, are also available, but have limited distribution (As of 2017, LG and Sony are the only TV makers marketing OLED TVs in U.S. Market), and are more expensive than their LED/LCD TV counterparts. With the refinement of features, such as local dimming and Quantum Dots, it is fair to say that the future of LED/LCD TVs is very bright. For more information on LED technology used in LCD TVs, check out a report from CDRinfo.